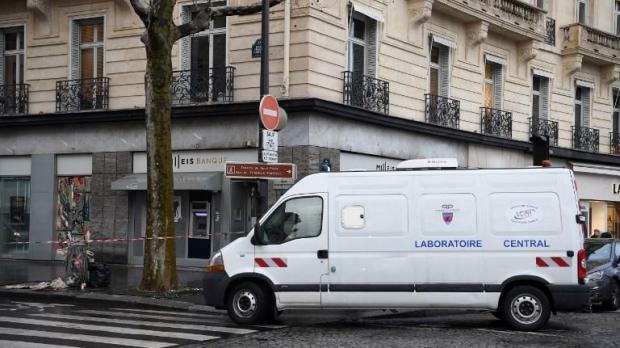 A French police forensic van is stationed outside the Milleis Banque close to the Champs-Elysees Avenue in central Paris, following a robbery. Armed robbers held up a bank off Paris' famous Champs-Elysees avenue Tuesday, tying up employees for hours and breaking into safety deposit boxes, police said. The daring raid saw several men rush into Milleis bank at opening time, tie up employees, and spray them with a mysterious liquid before rifling through some 30 safe deposit boxes, a source close to the investigation said on condition of anonymity. Formerly called Barclays France, the bank is less than 200 metres from the French presidential palace. Despite high security in the area, the men made an undetected getaway several hours later, around midday, with their haul from Milleis, which targets high-end customers. The value of the stolen items was not immediately known. "We saw nothing, heard nothing. It was when police arrived that we found out what was going on," a nearby shopkeeper told AFP as investigators swarmed the area. A lone gunman attacked a bank near the Arc de Triomphe monument in February last year, but was shot and arrested by police. In 2017, two men held up a luxury watch-makers just off the Champs-Elysees, getting away with several hundred thousand euros.